Arvind Gaur who heads the Delhi based Theatre group ASMITA is committed to innovative and socially relevant theatre. Starting off as a journalist and working for sometime for the electronic media, he set up ASMITA and earned a reputation in theatre circle in India and abroad. Arvind Gaur has conducted many theatre workshops and performed in various Colleges, Institutions, Universities and Schools in India and abroad such as Stanford, Harvard University, Stony Brook Univ, Smithsonian (Washington DC),Nehru Centre( London), Jawahar Lal Nehru University, IILM , I.I.T. (Delhi), British Council(Delhi) , Mothers International School , Sahyadri school (KFI , India), AIIMS , School of Planning and Architecture, Gargi,kamla Nehru, Hindu, LSR and IP colleges. He was also the guest faculty of DU for Theatre in education program for three years. One of the Solos directed by Arvind gaur - Bhishma Sahni's MADHAVI, received special award for experimentation with tradition at International Solo Theatre Festival Armenia and “"Color of Nation” award at the International Theatre festival in NIZHNEVARTOVSK THEATRE FESTIVAL, Russia. Recently Madhavi was performed in Vangneray, Lyon International Theatre Festival March 2006, France. Director Arvind Gaur has also collaborated with various Theatre artists and Groups specially in exploring a new language for Solo performances which includes Dario fo's 'Story of the Tiger', solo by Jaimini Kumar Srivastava, 'Women in Black' by Bubbles Sabharwal and "Untitled Solo" by Lushin Dubey in collaboration with Theatre World. Not only have these plays received great audience response from important metropolis of India, "Women in black" was invited to perform in Dubai and "Untitled Solo" was performed in Chicago, Dallas, Washington DC, Boston, Rochester, San Francisco, Ohio in USA and at the Edinburgh Theatre Festival last year. Pinki Virani’s "Bitter Chocolate " a new solo by Lushin Dubey directed by Arvind gaur was also performed at Harvard (USA) & at Nehru Centre, London. ‘Gandhari’ solo performance by Aishveryaa Nidhi was directed & performed at NIDA theatre, Sydney. Recently with British actress Ruth Sheard, he has directed two solo plays- Sarah Kane’s “4.84 Psychosis” and Dario Fo- Franca Rama’s “A woman alone”. With Rashi Bunny, young actress trained in Theatre design at University of Alabama at Birmingham and Rutgers University, New Jersey, USA Arvind Gaur has directed three solo plays. Bhishma sahani's "Madhavi ", Manjula Padmanabhan's 'Hidden Fires' and 'Walking through the Rainbow'. Madhavi & Hidden fires has received rave reviews all over and have been invited to perform for Mahindra's Old World Theatre Festival, Vivachana National Theatre Festival Jabalpur, Muktibodh Natyaotsav raipur, 5th National Theatre Festival Balaghat, World Social forum Mumbai and National School Of Drama (N.S.D. ), Satta Festival Jaipur, Theatre Club J.N.U., PCVC, and Queen's Award Project (UK) for Communal Harmony. After his fellowship research from HRD, he started his Delhi based Theatre group ASMITA. Arvind Gaur has directed more than 50 plays which include Girish Karnad's Tuglaq and Rakt Kalyan, Dharamveer Bharti's Andha Yug, Swadesh Deepak's Court Martial, G P Deshpande's Antim Divas, Albert Camus' Caligula, Mahesh Dattani's Final Solutions and Tara, Eugene O'Neill 's Desire Under the Elms, Dario Fo's An Accidental death of an Anarchist, Dr.Narenda Mohan's Kalandar, Bertolt Brecht's Good Woman of Setzuan and Caucasian chalk circle, Samuel Beckett's Waiting For Godot, John Octanasek's Romeo Juliet and the darkness, Neil Simon's The Good Doctor, Vijay tendulakr's Ghairam Kotwal, Munshi Premchand's Moteram ka Satyagrah, Ashok Lal's Ek Mamooli aadmi, Rajesh Kumar's Me Gandhi Bolto ,Vijay Mishra 's Tatt Niranjana, Doodnath Singh's Yama Gatha. 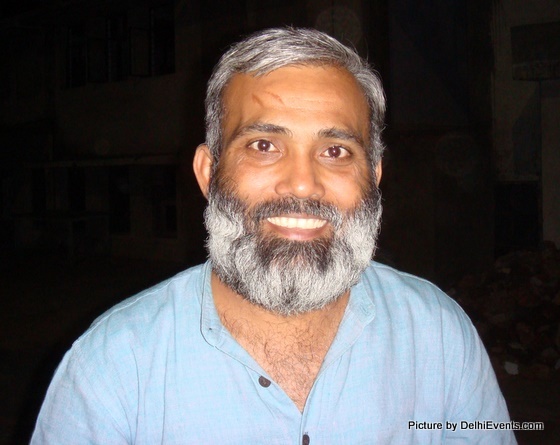 Arvind Gaur has conducted many theatre workshops for children in schools and slums as well as Street Theatre performances on different socio-political issues. He has also conducted theatre workshops for Actors and Directors at Houston, USA and India Habitat Centre, New Delhi. He also performed various plays in collaboration with organizations like Theatre World, British Council (Chennai), NSD, SKP and Sangeet Natak Akademi, IHC, Association of British scholars(Delhi), Paridhi, Bahroop, Banjara Theatre group (IIT, Khargpur),IIC, Nehru Centre (mumbai), Rainbow Cavaliers, M.Dot Band (Jaipur),Vivchana (Jabalpur), Prithvi Theatre Festival (platform theatre IHC, 2004), Ladies Club( IIT Bombay) and NGOs like Mobile Creches, Action-Aid, Haq, PCVC, Times Foundation, Deepalaya , Miralaya, Heinrich Boll Foundation, Asian Social Forum, Youthreach, World Social Forum and Aalo- a ray of hope etc. He worked with renowned theatre director Prasanna and also designs lights for NAYA Theatre under the Direction of Shri Habib Tanvir.